Acer is getting a head-start on Windows 10, releasing a new smartphone that comes with Windows Phone 8.1 but which it promises will be upgradeable to the new OS when it arrives later this year. Called the Liquid M220, it's priced from €79 (US$89) and will go on sale in Europe, the Middle East and Africa. Acer couldn't immediately say if it will be sold in the U.S., but it's been focussing on EMEA lately for its mobiles and wearables. It is one of many low-cost phones Acer is announcing at the Mobile World Congress in Barcelona. The others run Android. The M220 has a 4-inch screen, which is similar to other low-cost Windows handsets like the Lumia 435 and Lumia 512. It has a 5-megapixel rear camera and a 2-megapixel front camera, and comes with a bevy of Microsoft apps including Cortana and OneDrive. 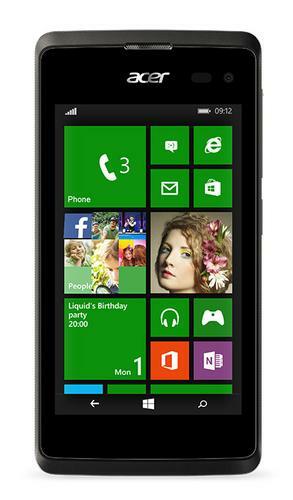 The smartphone supports 3G-HSPA+ communication and doesn't have LTE, just like other low-cost Windows handsets. Other features include a dual-core processor, 4GB of storage, 512MB of RAM and two SIM slots. Acer guarantees the device will be upgradeable to the mobile version of Windows 10, which some other Windows phones can't boast. It also provides a relatively low-cost entry point for a Windows 10 smartphone. Acer also announced the Jade Z smartphone, which has the features of a premium Android device at an affordable €199. It's LTE-compatible with a 5-inch Gorilla Glass display, a MediaTek 64-bit processor and a 13-megapixel camera. It is 7.9 millimeters thick, weighs 110 grams and will ship in Europe in March. Also shipping in March is the Liquid Z220, which starts at €89 and has a few features similar to Lenovo's second-generation Moto E smartphone. It has a 4-inch screen, 8GB of storage, dual-SIM slots, a 5-megapixel camera rear camera, a 2-megapixel front camera and a dual-core Qualcomm Snapdragon 400 processor. It runs Android 5.0, known as Lollipop. Acer also introduced the Liquid Z520, which has an 8-megapixel camera and starts at €109. All the new smartphones will be compatible with Acer's new Liquid Leap+ activity tracker, which straps around the wrist. It's OS-agnostic, which means it can work with devices running Android, Windows and iOS through the Acer Leap Manager app. The tracker has a 1-inch OLED screen and monitors steps and other basic activities. It can receive email, calendar and SMS notifications via a smartphones. The device will start selling in EMEA in March for €79.